A regional daily is urging readers to wear 20-year-old football shirts as part of its campaign to keep one of its patch’s most famous exports in the city it serves. The Norwich Evening News is campaigning against plans by drinks giant Britvic to close its manufacturing plant in Norwich, where Colman’s Mustard is produced by Unilever on the same site. The proposal has put 350 jobs at risk and threatens to end a 200-year association between Colman’s and the city. 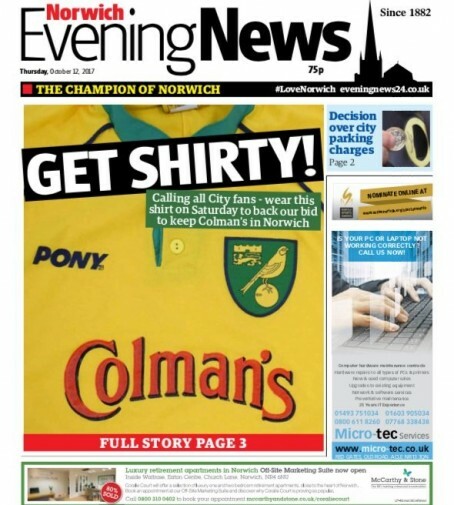 Now the Evening News wants fans of Norwich City Football Club to show their support for the campaign by donning shirts bearing the Colman’s logo at tomorrow’s match against Hull City. Colman’s was the club’s main shirt sponsor between 1997 and 2001, and the newspaper has called on readers to dig out replicas from that era and wear them at the game. The NEN splashed on the drive yesterday. So far more than 10,000 people have signed the paper’s petition against the proposal, meaning the government is now duty bound to respond. Editor David Powles told HTFP: “The idea was actually the brainchild of our business editor Mark Shields when we were discussing what next for the campaign and how to try and get Norwich City fans involved in the campaign. “We’ll have staff at Carrow Road on Saturday getting people to sign our petition and pose in their shirts. The early response has been very promising. In a comment piece on the subject, David wrote: “I was at the launch of the Norfolk Community Foundation’s Vital Signs report when our head of news Ian Clarke texted me about the news Britvic was looking to close its Norwich office, with the loss of around 250 jobs. Good luck with that – remember Norwich Union? Boulton & Paul? Start-rite shoes? Come to think of it, remember Eastern Counties Newspapers? Erm, and the fate of Prospect House? Makes the line about “businesses should see the benefit from being seen as a good, stable employer and having intrinsic links in a community” a bit lame. David’s a really nice guy, but I’m really not sure about this idea. “Businesses should see the benefit from being seen as a good, stable employer and having intrinsic links in a community.” In an Archant title – that’s Archant, which has chipped away at its workforce in their own communities to the extent that production work for Devon titles now happens in Norwich. Pot. Kettle. Black. I can’t imagine many fans having a Norwich shirt from that far back. With respect it’s not like the retro Tottenham, Man United, Liverpool, Chelsea ones you can readily buy. And why indeed would you put yourself out of pocket? Far better to donate to a fund for the workers’ benefit should the worse happen. Alternatively do the usual thing and get the support of the local MP! City fans wearing an old shirt will not persuade the board st union lever to reverse their decision, especially when ‘bscked’ By a news(?) paper eco high now only sells a few copies, this was just a bandwagon jumping exercise to get the ailing title noticed.